May first, May Day, is a day designated to celebrate Spring. It is a day of political protests. It is a neo-pagan festival, a saint’s feast day, and a day for organized labor. In many countries, it is a national holiday. In Champion some like to make note of the number of different shades of green visible on that day, particularly in contrast with the still vibrant dogwood blossoms. That can be a subjective number as green is often in the eye of the beholder. It is easy to see that unfortunates living elsewhere might be jealous of the vistas—on the Bright Side. What a Champion! Twelve year old Little League pitcher, Mackenzie Brown, of Bayonne, New Jersey threw a perfect game last week and was invited to throw out the first pitch at the Mets’ game against the Washington Nationals. Anybody who attended school at Champion years ago can point out right where home plate and second base were…the other bases too. They get a wistful look in their eyes and it is easy to see they are remembering wonderful days. National Volunteer Week festivities were wrapped up in Peoria, Illinois on Friday the 24th, at the Crittenton Center. This is a multi-service, not-for-profit, child welfare organization. Eight of the center’s top volunteers received the President’s Volunteer Service Award. Peoria Mayor Jim Ardis gave out the awards to a group that has performed about 67 hundred hours of community service combined. Volunteers at the center do everything from relieve the staff to play with the children. And most of the recipients have been working at the center for several years. There are about six hundred volunteers that work at the center throughout the year. The President’s Volunteer Service Award was created in 2003 to inspire others to contribute to their communities through volunteering. Champion’s own Barbara Krider was one of the recipients of this prestigious award and spoke to the media after the presentation. She was very poised in her remarks and spoke to the value of the volunteer’s efforts in terms of giving the critical staff relief to do their important jobs. Barbara wore a periwinkle lavender jacket with jewel neckline over a light blouse and skirt. Champions are well represented by their stylish (if largely absentee) resident and are optimistic that her schedule will give her time to return home soon. She will be glad to have missed the Clampett-mobile. The Clines, of Seymour, who have diverse interests in the auto-racing, auto-restoration, and all things auto made themselves quite the spectacle on Saturday. The connection of Ms. Cline (whose interest is in Mr. Cline) to General Upshod could no longer be denied as she stood next to him as close as she would to an Uncle while watching her spouse and lovely cousin Elva roll by in a heap of hillbilly junk that would have embarrassed Ellie Mae and everyone knows that Ellie Mae is just about the most fun loving, gentle and non-judgmental person ever depicted as real. Imagine plastic lawn chairs, wooden crates and benches, floor lamps and rusty wash tubs rattling down the road giving every appearance of impending complete collapse. Cartoon like and as unbalanced as the General, the thing lumbered along with no clear origin or destination. The vehicle, however, has a substantial drive-train, appropriate tires in good repair and all the pertinences required to make it go. While roadworthy it is probably not legal and the Clines are enjoined not to try to take it on the open road. It is noteworthy and delightful to know that Elva is making a good recovery from her broken foot or surely her Dear Mother would not have let her go off with the General! It was noted last week that Barbara is the wife of the brother of the sister of the General, but in reality she is the wife of the brother married to the sister of the General. May Day will be an excellent day for planting all the above-ground crops according to Linda’s Almanac from over at the Plant Place in Norwood. The next good planting day will be the 7th, so there will be time to get all those farm chores done in the interim. Gardens are going in all around the country and there is said to be a renewed interest in studying all the country living subjects that are now being called “sustainable.” Gardening, wild-crafting, food preserving, herb-lore, recycling, composting, live-stock raising, and bartering are all things that are part of the fabric of this part of the world. Champion has sustained itself through tough times with hard work, humor, music, and good neighboring. Mayday is an emergency code word used internationally as a distress signal in voice procedure radio communications. It comes from a French word, which means “come help me,” and is used to signal a life-threatening emergency. The call is always given three times in a row (“Mayday Mayday Mayday”) to prevent mistaking it for some similar-sounding phrase under noisy conditions, and to distinguish an actual Mayday from a message about a Mayday call. Soldiers and sailors use it around the world and many of them are U.S. Service Personnel. Champions all hope when the signal is used that help arrives promptly. When those Veterans arrive home Champions hope they will be met with the Love and Gratitude of their Nation. How thrilling it must be to have a birthday on May Day! The whole world celebrates with flowers and fun and light hearts. Sing, “When Irish Eyes are Smiling sure it’s like a morning spring. In the lilt of Irish laughter, you can hear the angles sing. When Irish hearts are happy, all the world seems bright and gay. And when Irish eyes are smiling, sure, they steal your heart away.” Mailboxes at Champion Items, Rt. 2, Box 367, Norwood, MO 65717, and at Champion News are receiving any kind of beautiful song, any kind of optimism, nostalgia, garden tips and bragging. Look at www.championnews.us for the fun of it. Sing any good song out on the porch at Henson’s Store, where many a fine singer has stood before. Gaze down Lonnie Krider Memorial Drive and be swelled with pride, for when you are in Champion, your Looking on the Bright Side! “Stand around on the porch at Henson’s Store on the North side of the Square to hear meadowlark chimes–the sonorous sounds of the bucolic nature of Champion where hearts are happy and they are always Looking on the Bright side!” That was last week’s news and still an invitation because Champion is a very inviting place. Connie Landsdown, Louise’s daughter, was happily surprised on Sunday as she was leaving church. “That girl looks like Ashley!” she said. The girl was Ashley. She and Brittany and Brittany’s daughter Maria had flown in from Utah as a surprise for their Mom. Their sister Chelsea knew, but Connie was completely surprised. Good surprises are Champion! The Skyline Volunteer Fire Department has been busy holding classes and getting the storm damage cleared up from Hurricane Ike. The Annual Skyline Picnic is scheduled for the 14th and 15th of August. It will be here about the time people are busy in their hay and trying to get their produce canned and frozen. It will be a welcome diversion from all the hard work. Champion’s good neighbors over at Denlow are getting ready for their 23rd Annual Denlow School Reunion which will occur on May 23rd this year. Preparations are under way. 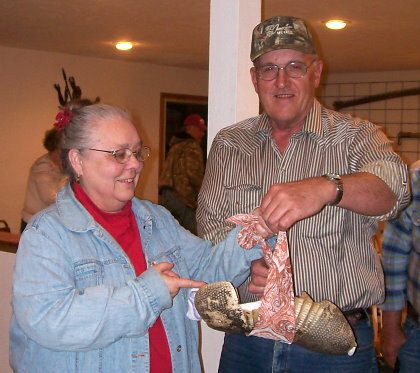 While on her Easter sojourn to their rural Champion estate, Barbara Krider, of the Illinois Kriders, generously donated one of her couture armadillo handbags to the General as a centerpiece for the Denlow soirée. The General and Barbara are mishpocheh, that is to say ‘family.’ More clearly understood, the term is most often used to mean family that is not blood kin. Barbara is married to the brother of the wife of the sister of the General. It is a close family, if spread out. Champions know that closeness has not all that much to do with geography. It is not yet clear if the General plans to simply display the handbag as part of the Denlow Collection, of if he will include it in the Auction that occurs at the event. As the event approaches perhaps more details will be revealed. It had been suggested that the famous bag would be available for view at the Champion May Day Celebration together with the other entries (photos only) of the AAF (armadillo art festival) but none of that has been confirmed. The General can be hard to pin down when it comes to specifics. Because Champions are always excited about potential, a survey is being made to see if palladium, a metal in the platinum family, is a common ore to these parts. News items from a hundred years ago frequently mention ores of various sorts—some called “Jack,” for example. Well, palladium, mixed with a little deuterium and a little electricity produces what is called cold fusion. It doesn’t sound like much, but it would sure put Champion on the map! Champion is already on the map and even finally in the right spot on most GPS systems and that ought to be enough according to some who reject change of any kind. Reckless brilliance is not enough for them. They want to be able to repeat the crackpot scientific experiments with some degree of predictability for their outcome before they buy into enthusiasm for a potentially world changing discovery. Champions are excited, but cautious. Champions are also thinking about old friends far away. Tennessee friend Darrel Haden comes to mind. He probably has one of the largest collections of vinyl records around. A search of his archives might come up with a copy of “All The Goings On At The Courthouse.” That was quite a controversial tune a few years ago. Music’s power to inform, entertain, comfort and inspire is not lost on Professor Haden and his contributions to music appreciation are not lost on Champions! Now Ms. Susan Boyles from over in Scotland is wowing the world with her wonderful voice. She is singing “Cry Me A River” well enough to remind some old Champions of the beautiful Julie London. These old guys may not really be remembering Ms. London’s voice, but the song brings her to mind. One Champion wonders if Ms. Boyles might frequent The Forrest Café at Number Three Bristo Place in Edinburgh. She might meet Champion Sam Moses there and they would both be lucky! The 25th and the 26th will be good days to plant anything that bears its yield above ground. Anytime from the 24th through the 30th will be an excellent time to do transplanting, says Linda’s Almanac from over at the Plant Place in Norwood. Everything is looking so healthy and vigorous. It is a real test of patience for some Champions in frost-prone pockets of the country. They are good at the labor part, but the waiting part is hard. Spend some of that waiting time in correspondence with distant relatives and friends. Number Four in the series of Champion Picture Post Cards has been flying off the shelves. It features Charlie Lambert, Lonnie Krider and Danny Dry watching a two wheeled cart go by down on the Square. It was the occasion of Bud Hutchison’s trail ride last Spring. Another one of those should be happening any time now. No doubt a big supply of those cards will be on hand when the riders come through again. The Missouri Army National Guard 203rd Engineer Battalion will deploy this fall to Afghanistan. Many of the soldiers were previously deployed to Iraq in 2003. Since that time, some have deployed with other units for third and fourth tours of duty. Staff Sgt. Micah Roth of Joplin, now in his ninth year with the Missouri National Guard, is deploying for the third time. He first deployed to Iraq in 2003 with the 203rd, and later in 2007 with the 35th Engineer Brigade out of Fort Leonard Wood. This will be his first tour of duty in Afghanistan. “I really want to go on this deployment because elements of the mission could be dangerous, and I know a lot of the soldiers who are going,” said Roth. “I just can’t see them going without me.” Love and Gratitude are the watch words. Thoughts about old friends, good surprizes, garden lore and watch words are welcome at Champion Items, Rt, 2, Box 367 Norwood, MO 65717. Songs of any kind, sweet, silly, or sad are welcome at Champion News. Sing, “When I was a lad and old Shep was a pup…” out there on the porch at Henson’s Emporium in Downtown Champion. Look down the broad expanse of Lonnie Krider Memorial Drive and be glad to be Looking on the Bright Side! Champions are always grateful for a gentle Spring rain even if it comes on Easter Sunday. The very unpredictability of weather engages the attention and interest of farmers, gardeners, and mushroom aficionados. While it is frequently the subject of all the conversation there is to be had, rarely do Champions complain about the weather. “What’s the point?” one asks. Even a guy who spent the afternoon standing out in a cool drizzle for three hours ultimately using his own radio antenna to open the door of his truck, the keys locked inside it–even he did not blame his situation on the weather. While timing was good for a nice rain, the Champion Easter Parade finally had to be cancelled. A contingent did parade around the Mall for a while just to blow off some steam over their disappointment. Kalyssa Wiseman and Chante`(spelled with an accent mark) Michaud were the outstanding participants among the junior set. Kalyssa’s frock was a soft yellow voile with tiny pink dots from the Madelyn Ward collection. It featured a gathered skirt with a wide ribbon trim around a plain bodice. She wore pink tights and white leather sandals. Chante` was stunning in a spring floral cotton print composed of tiers of detached ruffles from the neck to the hem at mid-calf. The ensemble was completed by a pastel green long sleeved body shirt and purple jelly flip flops replete with LED lights at the heels. Mrs. Ruth Shaw of Waterloo, Iowa, an infrequent but always welcome visitor to Champion, also chose a spring floral motif. Pink dogwood blossoms adorned her skirt, which was topped off with a sporty navy jacket decorated with unmatched blue stone brooches, gifts from her son. She wore rose quarts ear-rings and matching pendant. Ruth’s sister, Rita Krider, of Elmwood, Ill. had similar jewelry of a pale blue lapis lazuli set off nicely by a crisp white short sleeved jacket over a bright print skirt featuring yellows and reds. And red! Who but Barbara Krider could carry off the drama and excitement of that color so well? It was inspired! Delicate dangling gold filigree mandala earrings were the finishing touch and once again Barbara has set the standard for style. She also has generously agreed to share some of her Fashionista Tips and the one chosen from her list for this week is: “Don’t get a tattoo that will show in a bridesmaid’s dress.” All Champion women can benefit from Barbara’s life experiences. Sarah Michaud, Chante`’s Mother, has just been named Oxford Health Care’s Employee of the Month! Apart from the recognition for a difficult job well done, there was a nice little bonus and a spot in the running for Employee of the Year! Champions all wish her good luck and are pleased to be acquainted such a pleasant and positive person. Pete and Kate Proctor have been having a good time. They had their son Bryan and his family visiting with them for a whole week. They’ve gone back to Virginia now where Bryan will be stationed for a while. Pete e-mailed, “I can sure sleep a lot better since he is back home for now.” Parents and families all across the country are missing their soldiers serving around the world in the dangerous places. They have the Love and Gratitude of their Nation and when they get home there will be chances to show them that appreciation. More than one person has corrected the reference to singing teacher Arthur Porter (not Peterson as reported last week.) His father, Everet Porter, had been a singing teacher too. At various times both Harley and Lonnie Krider told the story that they would be in Ava with their Dad, Oscar, when they would run into Mr. Porter on the square. In no time, Porter would pull a song book out of the hip pocket of his overalls and before long he and Oscar would be studying a new song, marking out the timing, and exploring what it had to offer…right on the busy street with commerce going on all around. Music is a gift. Dianne (Krider) Strickland joined a rowdy rabble of family and friends at Plumbers in Vanzant on Thursday (This is whole other story.) for dinner and music. She had the good news to share that on April 7, 2009, the song “I Can Go Back Anytime” made Number One on the National Bluegrass Charts. The song was written by her daughter, Jennifer Strickland, and was recorded by Carrie Hassler. Dianne is the niece of all those musical Kriders–Harley, Lonnie, Donald, and Vivian (Krider) Floyd. She is delighted by her daughters’ accomplishment—pleased as punch! Champion gardens are just percolating with life! Little peas and beets are up in places. Linda’s Almanac from over at the Plant Place in Norwood says that the 17th and 18th will be good days to plant any kind of root crop. With everything so lusciously green it is difficult to be patient about those more tender things. Some say that May 10th is the last possible frost date in these parts. A native Champion said that it thundered on the 10th of February, so it’s likely there’ll be a cold spell in May. Dustin Cline’s granddad said that if it rains on Easter Sunday it will rain the next seven Sundays in a row. Champions wouldn’t mind a nice rain once a week through the growing season, but they’ll take what they get! Linda took a trip to the Lake of the Ozarks to meet up with her granddaughter for an Easter visit. That will have her in a good mood to do all the hard work it takes to make Champion gardeners successful. In the midst of the wretched destruction of a beautiful wooded glen stands one giant old dogwood tree about to bloom like crazy! “You missed one, you money-grubbing, carpet bagging malefactors!” shouts a still angry neighbor, but the boughs of flowers soon to come will soothe some of that ire. Birthdays come around like taxes and on tax day for some! Stacy may take her spouse to Rockbridge to celebrate his, if he straightens up a little. Vivian Floyd will be celebrating if not counting, and so will G.G. Jones, who must be getting terribly old. Listen to Carrie Hassler and Hard Rain on the radio to recognize “I Can Go Back Anytime.” The album got great reviews and Jennifer Strickland’s song is called beautifully sentimental. Sentimental songs are welcome at Champion Items, Rt. 2, Box 367, Norwood, MO 65717. Silly songs or sad ones go to Champion News. Stand around on the porch at Henson’s Store on the North side of the Square to hear meadowlark chimes–the sonorous sounds of the bucolic nature of Champion where hearts are happy and they are always Looking on the Bright Side! April slipped in to Champion quietly as the March lamb left and all was springly sweet and pleasant those first few days. T.S. Elliot was right though when he said, “April is the cruelest month, breeding Lilacs out of the dead land, mixing Memory and desire, stirring Dull roots with spring rain.” Mr. Elliot wrote his poem, “The Waste Land,” in 1922, and it lives up to its name with some very dreary imagery. Clearly, he was not from around here because even the brutal cold winds of those next few days with threats of snow and frozen flowers did not frost the spirits of Champions though they may have been picking ticks from their long handles. Long time Champion Minnie Snoddy marked her 100th birthday recently. She lives at the Ava Place and her daughter-in-law, Louise Hutchison, said the dining hall was so full of people they couldn’t be stirred with a stick. It was a great party. The Mayor gave Ms. Snoddy a key to the city but nobody said what it unlocks. These wonderful gatherings always unlock a lot of memories though, so the day was full of all the best things…family and friends. A big group from Iowa, which included her son, Manuel Hutchison, and much of his family, joined with local family to honor a great Champion. Those Tennessee boys have been back in the neighborhood. They are growing up fast. They like coming to Champion and are always a big help on the farm. Dakota has been doing a lot of scrubbing in the dairy barn and there is not much telling what all Dillon has been up to. He is great entertainment to his younger cousins, Foster and Kalyssa. He and Foster have the same kind of cowboy boots…snakeskin with brass trim–very fancy. Kalyssa is developing her singing voice. Her vocabulary is expanding rapidly and so is her vocal range. It has been clear since she was just a little thing that her Grandfather Krider’s music legacy has found a fine home. That gift has been spread liberally among Lonnie’s grandchildren. Some will not give up volume for control, but that is just a matter of youth. Their great uncle Harley has some volume and some control of some things. He was part of that Arthur Peterson led trio…he and Eldridge Hicks and Larry Wrinkles. Those three could blend voices, it is said, in such a way as to draw tears from the eyes of cynics, snobs, and beaurocrats, as well as from the eyes of honest farm people and shopkeepers. Perhaps the trio might reunite and reprise some of their earlier work. They may last have sung together in the 1960’s, so they might better hurry if the legend is to be preserved. Harley and Barbara will be back in town for the Champion Easter Parade and Egg Roll so a musical interlude might be forthcoming. Fashionista Barbara will be setting the standard for Spring attire as usual. Hopefully their visit will overlap with the Tennessee contingent and if Vivian Floyd can make it over from Rogersville, Champion will be roiling in pleasantness! Sometime after his Mother’s 100th birthday party, Wilburn Hutchison went over to the Plant Place in Norwood and got himself some Egyptian Walking Onions. They are also known as winter onions and dividing onions and probably other things. He had been looking for some for a while so he was really pleased to learn that Linda had some. She has her Almanac for April out as well which indicates that the 10th of April all the way through the 14th will be good planting days. When April finally decides to behave herself, gardeners can get back out there and get some groceries in the ground. Unsettled weather is, well, unsettling and while Champions are not dependent upon the weather for their happiness, their gardens are different stories. Patience is a Champion virtue put to the test by natures vicissitudes. “Let us, then, be up and doing, With a heart for any fate; Still achieving, still pursuing, Learn to labor and to wait.” That’s Longfellow’s advice in the “Psalm of Life.” He sounds like a Champion. The Military Service is an honorable calling from which the entire population benefits. Love and Gratitude is the soldier’s due from the Nation he serves. The men and women in the dangerous places of the world doing now what is asked of them will have requests of their own when they get home. Their families struggle in the difficult economy and Champions find ways to help. Charlene Dupre has her good right arm pinned together with some big fancy pins. She can still manage to hold a hand of cards, however, and on Saturday night she sat in for the absent Vera Cruz player at the Fortnight bridge game. She was the decided victor with a score of 7050. Brushy Knob came in second at 4850 and Champion third at 4230. Norwood was low with 4090 points. That player took home $.50 and Charlene walked off with the grand prize money of $1.40! The Champion hostess served chicherrones, Cheetos and cherry pie. She means well. Champions will hope to have no reason to sing that song as some are very attached to their tattoos. For almost any situation there is a song. Email interesting ones to Champion News. At the www.championnews.us website in the “School Reunions” category a person can hear a short selection of Lonnie Krider, Wayne Anderson and Wayne’s daughter singing “We Live in Two Different Worlds.” The administrator of that site hopes to have more of that good music up soon. Meanwhile, a person can stand out on the porch at Henson’s Store and gaze down the broad expanse of Lonnie Krider Memorial Drive and feel a little melody rise up in him. Now he can send picture postcards taken from that very spot to lift the hearts of unfortunates living elsewhere in the dull and dreary parts of the world. Champions are a melodious lot and are ever Looking on the Bright Side!